1) Black is this week's signature color because Friday, November 25, was "Black Friday," when retailers cut their prices and consumers flock to the stores. Did you score any "Black Friday" bargains? 2) Feasting and football are also popular Thanksgiving weekend pastimes. Do your Thursday-Sunday plans include pigging out or watching a game? 3) At Thanksgiving dinners, Crazy Sam's homemade gravy is always a hit. (Probably because she's so generous with the cognac, which gives the gravy a nutty taste.) What was particularly delicious at your Thanksgiving table? 4) Among the biggest the Black Friday advertisers are Target, Kohl's, Macy's and Best Buy. If you could have a $100 gift card to any one of those stores, which would you choose? 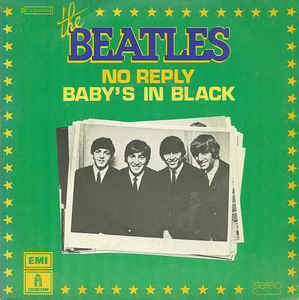 5) This week's song, "Baby's in Black," is about a girl who wears black because she's in mourning. Do you find that the color you're wearing reflects your mood? 6) The woman who inspired this song, Astrid Kirchherr, has been friends with Paul McCartney since he and his bandmates (John Lennon, George Harrison, Stu Sutcliffe and Pete Best) met her in Hamburg back in 1960. Tell us what you believe are the components of a strong, lasting friendship. 7) In the early days of the Beatles, Paul McCartney and John Lennon began writing a play but abandoned it. Do you have a novel, painting, play, song or poem that you're going to finish "someday?" 8) When he was 16, George Harrison dreamed of moving to Canada, Australia or Malta. In just a few years, he would visit all those places with Beatles and eventually decided there was no place like home and stayed in England. Have you ever thought about moving to another country? If so, where? 9) Random question: Finish this sentence -- If you want me to give you "yes" for an answer, the best time to approach me is _____________________. 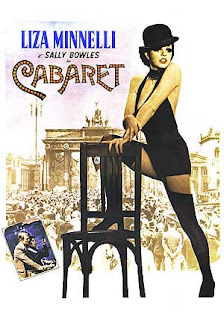 1) In this song, Liza Minnelli encourages you to put down "the knitting, the book and the broom." Which of those three were you most recently doing: knitting, reading or housework? 2) She sings that we shouldn't allow "some prophet of doom to wipe every smile away?" Do you know anyone who reliably looks at the downside of life? 3) In 1972, when this recording was popular, so was The Brady Bunch. In the two-part season premiere, The Bradys went to Hawaii. Do you have any warm weather vacation plans this fall/winter? 4) Though not her uncle, just a friend to both of her parents, Liza always called Frank Sinatra as "Uncle Frank." Is there an older person in your life who isn't a blood relative, but who refer to as "aunt" or "uncle?" 5) Liza collapsed onstage during a Christmas concert in 2007. She says she'd been nauseous before she went on and simply fainted. Sam has never fainted. Have you? 6) People are often surprised when they learn Liza is good friends with Gene Simmons -- the KISS member with the long tongue. Tell us about one of your good friends. 7) Liza told US Magazine that she loves to eat at Olive Garden. Do you? 8) She keeps apple juice and yogurt in her refrigerator at all times. Would we find either in your refrigerator right now? 9) Random question: Which would be a more frustrating dinner companion -- someone who won't shut up, or someone who won't say a word? 1) This is about the fateful cruise of the S.S. Minnow. If you had a boat, what would christen it? 2) "No phone! No lights! No motorcar! Not a single luxury!" To Sam, those sound more like everyday essentials than luxuries. If you were shipwrecked with the gang, what standard amenity would you miss the most? 3) The uncharted isle was in the Pacific, near Hawaii. Have you ever been to our 50th state? 4) Natalie Schafer, who played Mrs. Howell, refused to divulge her age. Are you honest about how old you are? Or do you fudge it? 5) Gilligan's Island featured many dream sequences. (Like the one where Gilligan dozes off and dreams that he's Jack from Jack and the Beanstalk.) Have you had any vivid dreams lately? 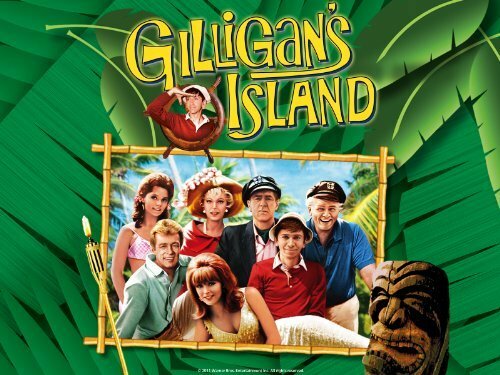 6) The pilot was filmed in November, 1963, in Honolulu. The cast and crew were actually onset when they learned of President Kennedy's assassination. * Because on location filming was so expensive, they couldn't afford to take any time off. Tell us about a time when you had to work, even though your heart and head weren't in it. 7) During the show's run, Mary Ann (Dawn Wells) was the clear fan favorite, receiving twice as many love letters as Ginger (Tina Louise). Have you ever written a fan letter (or posted a fan tweet or Facebook post)? 8) Sam chose this week's song because it was going through her head, over and over again! Tell us a song that burrows into your head and stays there. 9) Random question: You went to a discount store and got an amazing bargain -- a pair of dress shoes for just $4.99. You go to a formal event and someone compliments you on those great shoes and asks where you got them. Do you tell the truth? *That's why, in the credits for the black and white seasons, the flags are at half-staff when The Minnow leaves the harbor. 1) Britney Spears addresses this song to a dance partner when she hears her favorite song. What song always makes you want to get up and dance? 2) She sings that she needs a vacation. How about you? If you could escape anywhere for an affordable three-day weekend, where would you go? 3) Britney shows off her dance moves in this video. Her coordination shouldn't be surprising, since she was already an accomplished gymnast in grade school. If we asked you to turn a somersault right now, could you do it? 4) Britney's first and only feature film was Crossroads, written by Shonda Rhimes. Ms. Rhimes is famous for writing popular TV series including Grey's Anatomy, Scandal, The Catch and How to Get Away with Murder. Have you watched any Shonda Rhimes shows? 5) Britney admits to smoking and biting her nails. Do you share either of these bad habits? 6) Britney prefers Margherita pizza to thin slice or deep dish pizza. What's your pizza preference? 7) In 2011, when this song was popular, Prince William's wedding to Kate Middleton was big news. Are you a royal watcher? 8) Apple co-founder Steve Jobs died in 2011. Do you have a Mac, and iPad or an iPhone? 9) Random question: Which friend annoys you more, the one who interrupts you all the time, or the one who is never on time?